Buried deep within the archives of Northamptonshire Records Office are the papers of a family called Harpur whose principle seat was at Burton Latimer in that county. The Harpurs were distantly related to the Harpur-Crewes of Calke Abbey. The Harpurs also had a small estate at Chilvers Coton. There were two principle landowners in Coton at the time, the Newdigates at Arbury and the Harpurs of Coton or Caldwell Hall. Their combined family archives make our local parish one of the best documented in the country. Both sets of estate papers are fascinating to the dedicated Coton researcher. 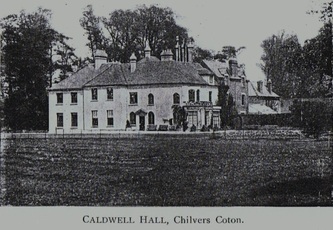 The site of Coton (later known as Caldwell) Hall was originally on the site of a former water mill, Cuttle Mill. An old Nuneaton family called Mallabone had anciently tenanted the mill. (Believed to be descended in antiquity from the Cheshire Norman family of Malbon). Joseph Harpur (1705-1777) had properties and land at Rugby, Hinckley and Caldwell, near Kidderminster (this is how Caldwell, Nuneaton got its name), and he acquired the Chilvers Coton property sometime around the period 1739-1742. The purchase of Cuttle Mill was completed in 1742. The mill was still extant in 1765 but may have been demolished to make way for a small mansion house, which was erected about 1776. Joseph’s first wife Mary Purefoy (1706-1737) died and he remarried Mary Powell and had several children with her including his heir, Joseph (1765-1827) who subsequently inherited Caldwell Hall, who then bequeathed it to his oldest son Henry Harpur (1798-1870). The house is described as having a dining room, drawing room, book room, servant’s hall, butler’s pantry, seven bed rooms and two dressing rooms, stables, double coach house, laundry, brew house and excellent offices. Ultimately the estate and small park extended to ninety acres. Henry Harpur was educated at Rugby School and Worcester College, Oxford and became a magistrate for Northamptonshire, Warwickshire and Leicestershire. He was also Deputy Lieutenant of Warwickshire. His brother the Rev. Latimer Harpur (1800-1872) married Ann Ebdell the daughter of the Vicar of Chilvers Coton, the Rev. Bernard Gilpin Ebdell (1780-1828). His wife inherited an estate at Knightcote. For a time the roadway we know now as Avenue Road, but was in those far off days, a rural lane connecting the village of Chilvers Coton and the hamletry of Attleborough, was known locally as Harpur’s Lane, before that Cuttle Mill Lane, and variously Coton Lane. The estate was situated at one of Coton parish’s four ends – Church End. (Virgin’s End, Heath End and Town End being the others). There is an interesting story told about Henry Harpur who was a very well respected and kindly old country gentleman. He had a room set aside in Caldwell Hall where he transacted his local business as a magistrate. Sometimes a constable might bring a miscreant before him where he would be fined on the spot for some minor misdemeanour, drunkenness particularly was a common complaint in those days. Having issued a small fine both the constable and the defendant would be taken to the kitchen and treated to a good meal before being sent on their way. Henry Harpur never married and when he died in 1870 Caldwell was put up for sale and by 1873 was tenanted by a family called Waterhouse. 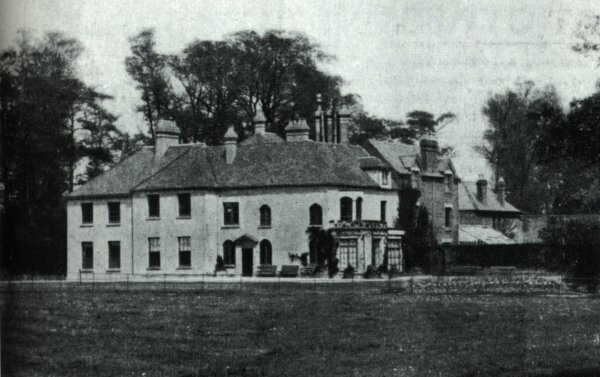 Their residency did not last long because by 1884 the owner was Walter Pearson Evans (1846-1920) the nephew of Mary Ann Evans (1819-1880) – the famous author – George Eliot. Mr. Evans had taken over from his father running various local estates for the aristocracy. As you probably know his grandfather Robert Evans (1773-1849) had famously arrived in Nuneaton as an estate agent for the Newdigate family. Walter Pearson Evans ownership ceased after 1901, and by 1912 the occupant of Caldwell Hall was a character called Manley Colegrave. Someone who has up until now defied all my researches. Ultimately Caldwell was purchased by Herbert Charles Jones O.B.E. J.P. (1868-1934), whose father Rufus Jones (1831-1922) was a wealthy elastic webbing manufacturer, who owned a factory on Attleborough Green. After 1917 Herbert Jones also acquired the Attleborough Hall estate and the Caldwell mansion house was left empty and untenanted. It was during this period that a fire broke out in the Hall on the morning of January 25th 1920. The south wing of the Hall was entirely gutted. The cause seemed to have been due to being unfurnished, fires had been lit in the grates to keep the Hall aired during the winter months, but a chimney in a bedroom had caught fire causing beams adjacent to overheat and ignite. The alarm was given at 5.10am but it took four hours to put the blaze out by which time the roof had collapsed. What remained of the Hall was later occupied by Herbert Jones’s son, Phillip Rufus Jones (1910-?) but after World War Two the estate was sold off and the house demolished c.1946-49. The grounds of Caldwell Estate were known at one time for their birdsong. Nightingales congregated there once a year and local people visited the woods to listen to their annual gathering. You can read an article on Caldwell Hall from Nuneaton News by clicking here. 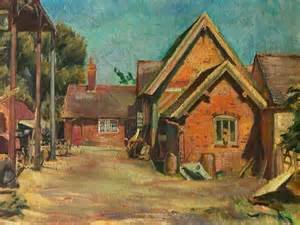 Possible painting by Miles Sharp of the farmhouse that used to be where Caldwell Estate is now. Thanks to Bev Moore 2014.